Looking for the perfect fabric to give to someone else but not quite sure what they'd like (or afraid you'll mess it up?) 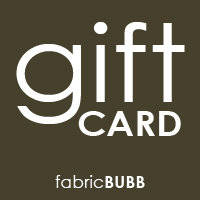 Look no further, give them the gift of choice with a Fabric Bubb gift card. These gift cards are delivered in an email which contains instructions on how to redeem. They do not expire and have no additional processing fees.